The arctic is calling for some Tromso hiking with breathtaking views! What to do in Tromsø in autumn? Tromsø is the largest city in Northern Norway. Tromsø is the gateway to Arctic! But even though it’s the gateway to Arctic, autumn is still autumn. Autumn might start earlier than in southern countries like the end of August/the beginning of September: Then every single leave turns its colour from greenish to reddish. Gras and bushes turn yellowish. There are many rainy days, but still enough sunny days for outdoor activities. Now and then the wind takes some leaves on a journey – the trees gets balder. 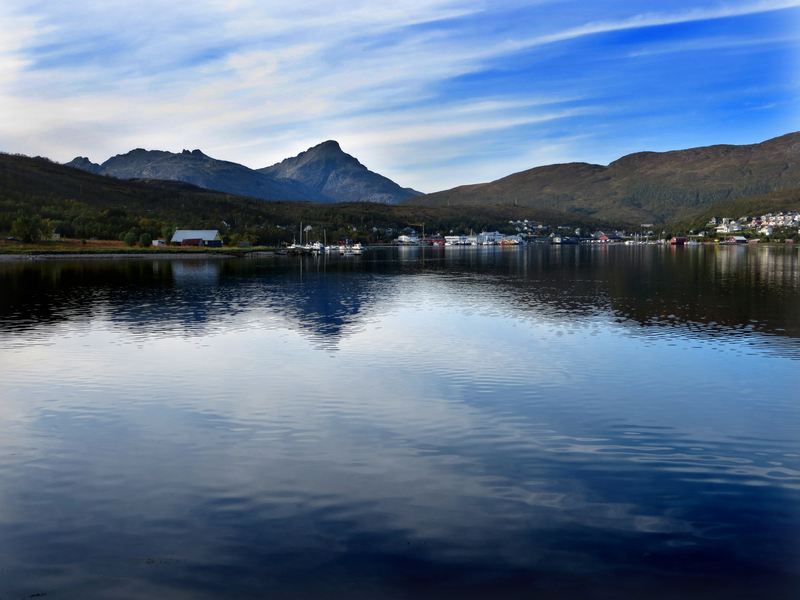 Kvaløya, the whale island next to Tromsø, turns into a enchanting autumn atmosphere. Do you love autumn? Then you should experience autumn in Tromsø. Besides watching Northern Lights at night, autumn in Tromsø is a good time for some hiking as well. Let’s change the view! Let’s enjoy Kvaløya from the top of the mountain! We’ve got three enjoyable hikes for you. Breath-taking views and some exercises are guaranteed. Store Blåmann is the highest mountain on the whale island. It’s about 30 minutes by car from Tromsø city. Follow the signs to the direction Kvaløya. You will pass the airport and cross the bridge. Then keep left and follow the signs to Eidskjosen. At Eidskjosen is a supermarket, there you need to turn right in the direction Tromvik. Keep going, enjoy the beautiful environment :). After a little Store Blåmann will appear in front of you. Keep going until you passed a little village. Then a parking comes up. At the very beginning a little path is visible. Now and then you might loose the path. Anyway watch out for read marks or rock milestones and you’ll be fine. The first part is quite easy. Then the grass ground changes into stones. If you looses the marked path, don’t worry. Look for a comfortable way, but don’t risk anything. There might be dangerous parts, that’s why we recommend to do that hike with somebody who knows the way. We didn’t make it to the very top because we got lost and felt uncomfortable. But anyway it’s a really enjoyable hike with stunning views to every direction. We recommend to take warm clothes, because as soon as you make a break, you might get cold. Good shoes are necessary, the path changes from muddy to rocks. In my opinion it takes up to six hours to hike up until the peak. Lilie Blåmann is the little sister of Store Blåmann. Not as high as the big sister, but with amazing views for sure. It’s about 25 minutes by car from Tromsø city. Follow the signs to the direction Kvaløya. You will pass the airport and cross the bridge. Then keep left and follow the signs to Eidskjosen. At Eidskjosen is a supermarket, there you keep following the street straight. About 10 minutes later you will see a parking slot. That’s the place you can park and start the hike. First of all it can be a muddy, wet ground. Follow the electrical lines. The first part won’t have any marks, but the area is in a good condition, so you won’t have any problems with dangerous parts. Once you’ve got to the stone part and you passed a little house, you might see some red marks or rock milestones. As higher you are as colder it can be, so take warm clothes with you. In every part of the hike you’ll have amazing views to every side. Once we even found some old snow from last season, it seems like. With some breaks it took us about four hours for both ways. Tipp: In winter Litje Blåmannen is a popular skiing area. Hike up and find you way down on skis or on snowboard. Easy hike with lots of things to discover: little forest, fjords, lake, a never ending horizon. It’s about 40 minutes by car from Tromsø city. Follow the signs to the direction Kvaløya. You will pass the airport and cross the bridge. Then keep left and follow the signs to Eidskjosen. At Eidskjosen is a supermarket, there you need to turn right in the direction Tromvik. Keep going for about 20 minutes. Don’t forget to enjoy the beautiful environment :). After a little while you will get to a huge lake and at the end of the lake you’ll see a parking slot. That’s the place you can park and start the hike. It’s a really comfortable and easy going hike. A little path that is marked will show you how to get up to the top. First you will walk in a little forest with a little river and a house. Especially in autumn the forest shines in its most beautiful colours. As higher you get as more views you’ll have. Fjords everywhere! On the top you can watch the lake from above that you passed before by car. Tipp: This little hike is fascinating with midnight sun lights! After or likely before the hike you shouldn’t miss the lovely bay of Grøtfjord: white sand beach surrounded by huge fjords! In winter people like to surf waves there. For more hikes we want to recommend you another great post from Nerd Nomads – “7 easy hikes with spectacular views”. The post from Maria & Espen was very useful to get ideas what to do and how to get there. They talk about hikes you never could have imagine to hike up there and at the same time, stunning views are guaranteed. Check it out! (2.) 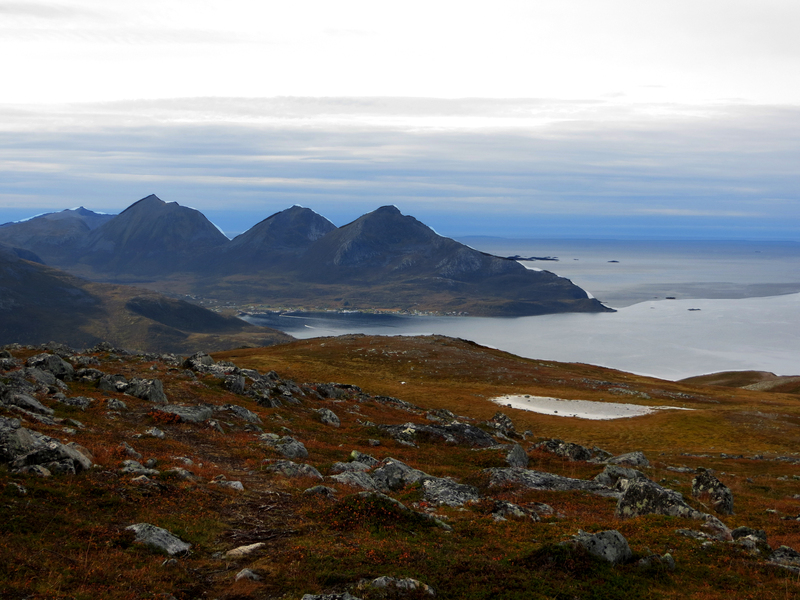 Fløya: Best hike to get an imagination how big the Tromsø island is in real! (4.) Nattmålsfjellet: Lovely little hike, with well marked path. At the end you’ll have the best view on Ersfjord where the whales perform in winter! (6.) Hillesøytoppen: You love white sand beaches? That hike will let your heart beat higher. All the beauty from above and you don’t have to walk a lot. If there has have been more time, we would have walked up every mountain! Wow! Great landscape, great pictures! Great list of hikes to do in Tromsø in autumn, Gonzalo & Jess! Awesome photos! Have actually never been to Bruna, so thanks for the tip! 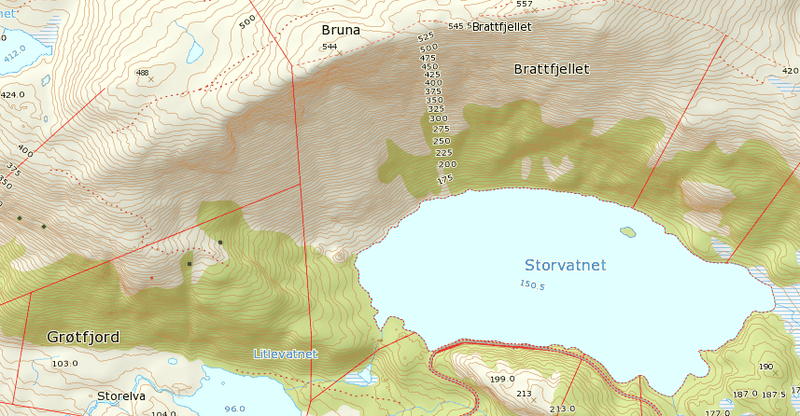 Will definitely go hiking on Bruna some day soon, maybe even tomorrow as the weather forecast is pretty good. 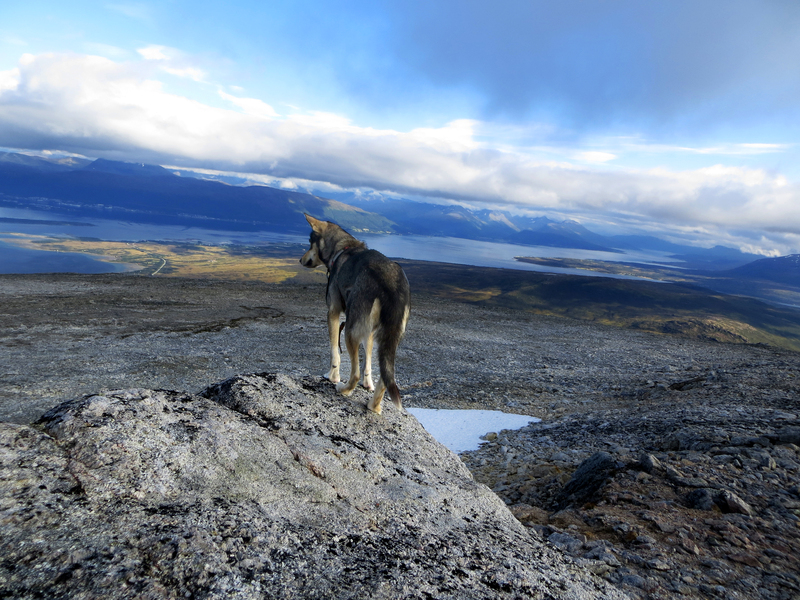 I`m so impressed that you did all these hikes on your Tromsø trip, wow, you must be very fit….hehe. Store Blåmann is pretty steep and a hard climb. Well done! Thanks for linking to our article! Happy travels! Bruna is a nice easy Sunday hike. Hopefully you’ll like it. Store Blåmann was a really tough hike but it is worths hiking because of the spectacular views. I think with every hike we’ve done, we got more fit! We hope to go back soon and to keep up with more hikes on your list. Lovely pics and informative post!!! I’m going to tromso in March and really excited! Any tips?! 🙂 ….thanks for the post anyways! !